We've posted a few of these photos before, but here is a little series showing how the bicycle increases mobility for those faced with physical challenges. The chap above is dapper and chic on his trike, looking sharp in his suit and scarf. The fact that his right arm is missing is a detail. He still gets around perfectly well. 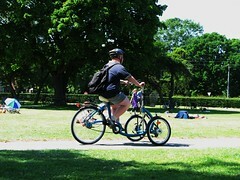 Cycling while pregnant is virtually a prescription in Denmark. It lightens the load and keeps you exercising and keeps you mobile. When aging sets in, there are still plenty of opportunities for getting around - and looking sharp while doing so. The bicycle is such a liberation tool to this day, just as it was back it at the beginning of bicycle culture. 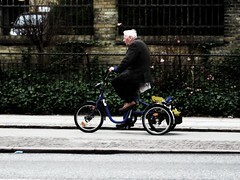 Many elderly ride trikes in Copenhagen. Disabled persons are often seen on bicycles, like this chap with Down's Syndrome at the beach last summer. If you're 'vertically challenged' as political correctness will have it, there's nothing stopping you from riding a bike. 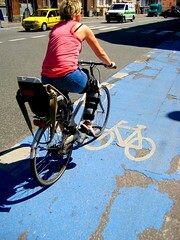 Even with a leg in a cast, if the injury allows it, you are flying along the bike lanes like there is no tomorrow. In the Netherlands those tricycles are generally for people with epilepsia, a classmate of mine in secondary school had one, because she was epileptic. But anyway, it's true that whatever disability someone has, this does not mean that person cannot use a bike (seriously, blind people bike, on a tandem with someone else steering, obviously, but still. Great and inspiring entry! 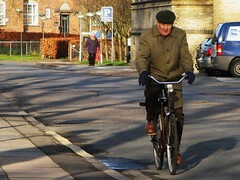 I also see a lot of old people in the Swedish town I live in, who cycle. One of them must have a hearing problem and attached side-view mirrors to his bicycle to watch for coming bikes from behind (who otherwise ring the bell). I haven't seen tricycles here yet though, except the ones very small children use. 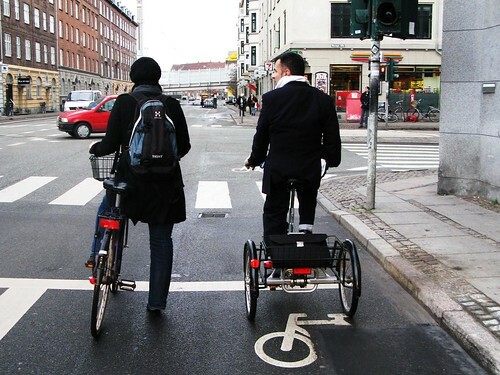 On another note, the neighboring city of Linköping has hired a bicycle consultant to make the whole city bike-friendly and make sure that all the suburbs are accessible by bike. I think they got an idea from the blue-colored Copenhagen bike lanes: there is word that bike lanes will be painted red. In my undergrad days I knew a man who was very obviously (although not "officially") partial inspiration for Prof. Xavier (and perhaps Dr. John Grey as well) from the X-Men (and so now any comic book geeks know where I attended college, but I'm never going back to my old school). A former athlete and guerrilla soldier; and the proverbial "bull of a man," but now paralyzed from the waist down, he kept himself in shape and scooted about quite handily on a hand cranked trike. And he wouldn't exactly qualify as a Slow Cyclist. 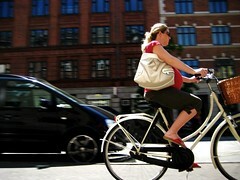 In the US, many insurance companies will not cover injuries incurred on a bicycle while you are pregnant. Sad. I think trikes are cool, even with two arms- I want one. 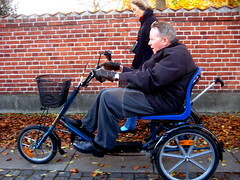 I saw a cool adapted tandem bike last summer on Amagerbrogade on my way to the beach -- dad in the back, steering, and the kid in an adaptive seat (more like a chair seat than a normal bicycle seat) in the front with a kind of ring around his chest to keep him upright. A creative solution that seemed to work very well! Here in the Netherlands you can get specially adapted bakfiets to carry a wheelchair if the person's disability will not allow him/her to ride. Michael, I loved this post and have sent it to other cyclists here, one of whom is a founder of Le Monde à bicyclette and who is 75 now - he can still ride a normal bicycle like the older gentleman on the normal bicycle in the photos. I'm glad people have mentioned hearing problems, which are invisible to other cyclists. adrienne, that is horrible. Cycling is one of the best exercises for pregnant women, as except for the odd bump, it is smooth and low impact, unlike jogging and many forms of gymnastics, and is part of a person's daily activities. Not doing any exercise if far more hazardous, and you know the serious health problems endemic in the US among sedentary people (especially working-class and poor people who can't afford private health clubs). Nothing but sites telling you it's a great way to keep in shape while pregnant. Here you remind people that cycling is healthy, not just practical.